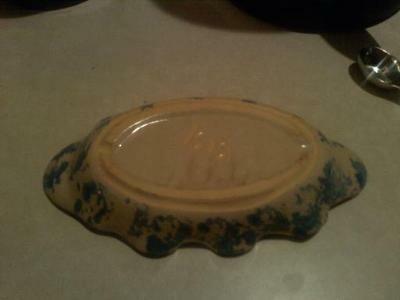 Pottery Mark Query - A stylized "BB" or "1313":- We have a small blue and yellow pottery tray with a ruffled edge that has a mark on the bottom that looks like either a "BB" or "1313". This mark was created by a void in the glaze. No ideas here on this mark, I'm afraid. Hopefully we will get a person who knows. Thanks for posting. Thanks to contributor, Steve's post below, we now know this mark is that of old American pottery Bybee pottery (older than many of the famous names of Staffordshire, England). This pottery is named after the town of Bybee, Kentucky and local knowledge says it began in 1809, but actual written records only go back to 1845. Based in an old log cabin the processes of production are all still done on site which is so different to how they work in Staffordshire today. They dig the local prolifically available clay out of the ground, grind it in the mill and then hand throw. 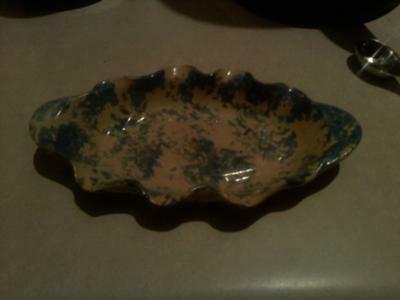 The Cornelison family run the pottery and they are the 6th generation to do so. Long may it continue. Next time I'm in Kentucky, I'm off to buy some beautiful crockery! 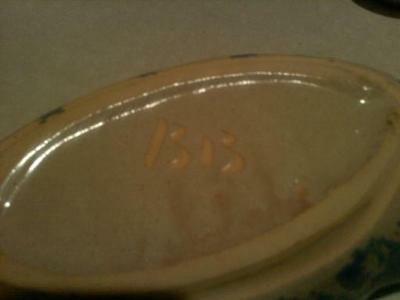 Comments for Pottery Mark Query - A stylized "BB" or "1313"
This is an ByBee piece. Made here in Kentucky. I was just researching a set that I have. Good luck ! Hey, Steve V, you gave us V for VICTORY! Thanks a million. Drop by again, anytime.